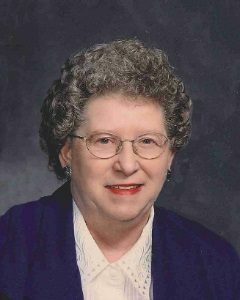 Carol Brelje, age 85, of Glencoe, passed away Monday, January 28, 2019, at Harmony River Living Center in Hutchinson, Minnesota. Funeral Service will be held Saturday, February 2, 2019, 11:00 A.M. at Zion Evangelical Lutheran Church in Winthrop, Minnesota, with interment following at Glencoe City Cemetery in Glencoe, Minnesota. Visitation will be held Friday, February 1, 2019, from 5:00-8:00 P.M. at the Johnson-McBride Funeral Chapel in Glencoe, Minnesota, and will continue one hour prior to the service at the church on Saturday. Carol Eunice (Engelmann) Brelje was born on January 26, 1934, in Helen Township, McLeod County, Minnesota. She was the daughter of Herbert and Eldora (Boesche) Engelmann. Carol was baptized as an infant on February 11, 1934, at St. John’s Lutheran Church in Plato, Minnesota, and was later confirmed in her faith as a youth on March 30, 1947, at First Evangelical Lutheran Church in Glencoe, Minnesota. She received her education in Plato at St. John’s Parochial School through the second grade, District #19 Country School in Bergen Township through the eighth grade and then attended the Glencoe High School. She grew up on the family farm. On July 12, 1955, Carol was united in marriage to Lowell Brelje at First Evangelical Lutheran Church in Glencoe. After their marriage, the couple resided south of Brownton in Penn Township and then moved to Glencoe in 2006. She was employed at Jensen’s Locker Plant near Glencoe in her younger years. Carol and Lowell were blessed with three children, Debra, La Vern, and Theresa. They shared 63 years of marriage. Carol was a member of Zion Evangelical Lutheran Church in Winthrop and a former member of the Ladies Guild. She taught Sunday School and played organ for services, weddings, and funerals at St. Matthew’s Lutheran Church in Penn Township. Carol played the accordion in her parent’s orchestra band. Carol was also a member of the Brownton and Glencoe Senior Citizens. Carol enjoyed traveling on the county roads, taking Amtrak and bus trips, sewing, embroidery, crossword puzzles, painting, gardening, dancing and card playing. She cherished the time she spent with her family, especially her children. Carol passed away on Monday, January 28, 2019, at Harmony River Living Center in Hutchinson, Minnesota, at the age of 85 years, and 2 days. Carol was preceded in death by her Daughter, Debra Brelje; Grandson, Brycen Erickson; Parents, Herbert and Eldora Engelmann; Brother, Gene Engelmann.